Down in the lair, Splinter is furious at Mikey for making a mess of the living room. However, it wasn’t Mikey that trashed the place; it was Leo and Raph, who have been fighting all morning. Splinter calls his bickering sons to attention and tells them that they need to learn to work together as a team. Suddenly, Donatello’s “Foot Clan tracker” starts going bonkers. Splinter tells Leo and Raph that they are to pair up on this recon mission while Don and Mikey stay in the Shellraiser so the two brothers are forced to cooperate. The tracker leads the Turtles to the docks where Dogpound and Fishface are picking up a shipment of weapons. Leo and Raph lurk atop some shipping containers and watch the two mutant henchmen trade insults. Leo wants to keep it a recon mission, but Raph decides to burst into a nearby warehouse on his own and take down some Foot Soldiers. The two Turtles proceed to whine at each other, losing focus in battle. Leo raises his sword and accidentally punctures a vat of “Super-Stik” adhesive. The flood of glue wipes out the Foot Soldiers but also sticks Leo and Raph together at their shells. At that moment, Dogpound and Fishface enter the warehouse. 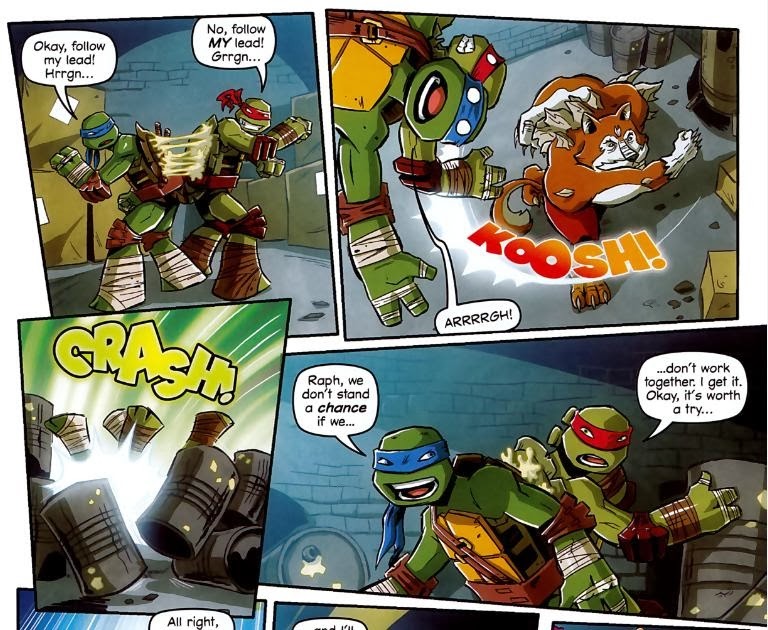 Leo tries to call Donnie in the Shellraiser for backup, but Don and Mikey are currently feuding because Mikey broke a piece of Don’s equipment. Dogpound and Fishface begin trashing the two Turtles, who eventually realize that if they want to survive, they’ll HAVE to work together. Coming together and working in tandem, they manage to momentarily get the upper hand on the hench-mutants and bring the fight outside. Their handicap eventually proves too much despite their cooperation and Dogpound and Fishface start beating on them again. Leo and Raph decide to concoct a new strategy and verbally egg Dogpound and Fishface into a fight. Already enemies, the two mutants start tearing at each other. Their tussle eventually lands them onto the crates of weapons which promptly explode. 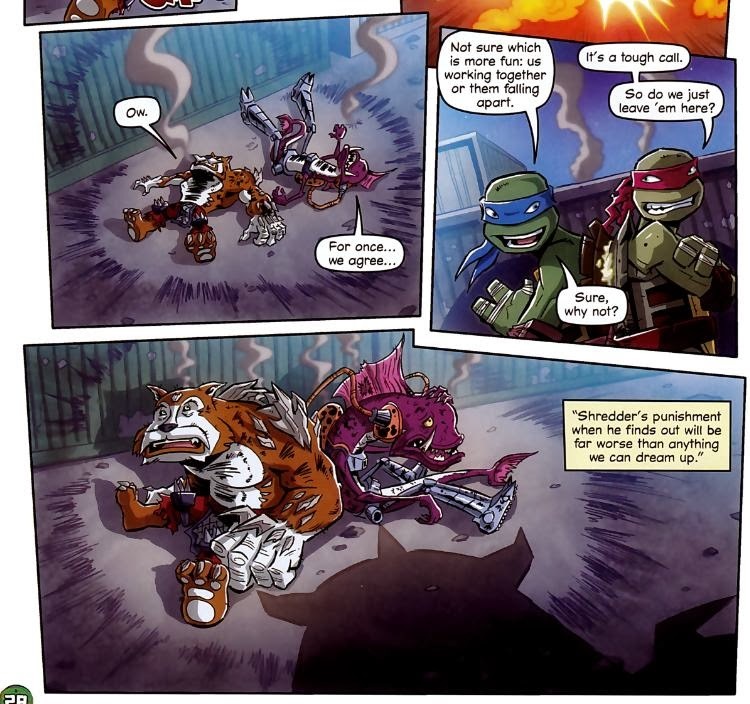 Leo and Raph decide to leave Dogpound and Fishface, as they figure Shredder will punish them severely for their failure. Back at the lair, Leo reads the warning label on a bottle of Super-Stik and finds that it will dissolve in 24 hours. Splinter is proud that his sons learned to work as a team and overcome their differences. Well, not all his sons. Donnie and Mikey are still bickering over the broken Shellraiser equipment. Splinter decides that they should also learn the value of teamwork and Leo suggests he teach it to them… with a bottle of Super-Stik. 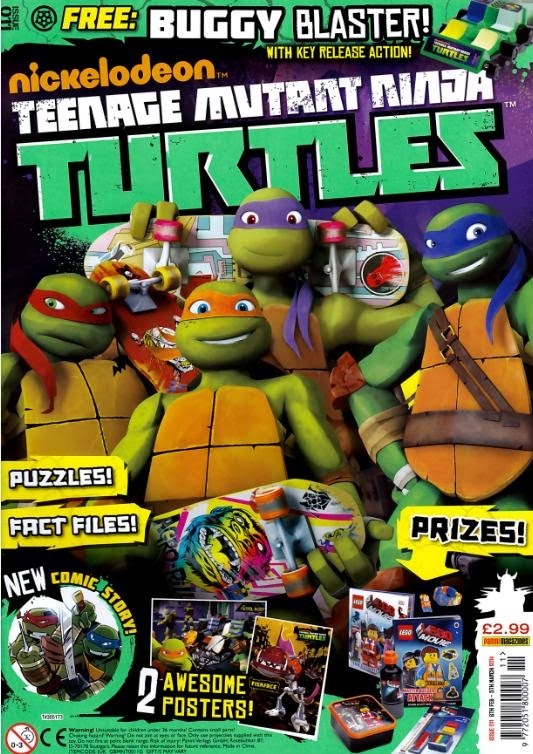 *This story is continued from TMNT Magazine (Panini) #10. 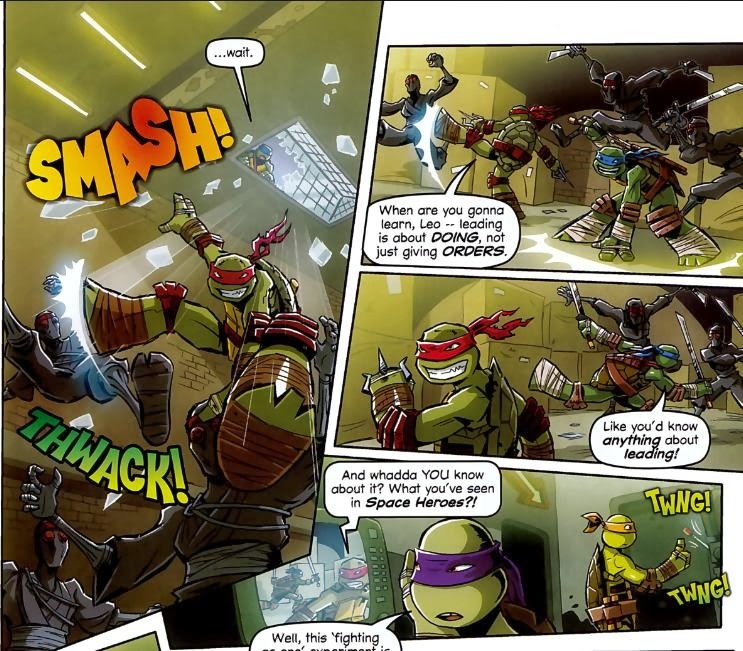 The story continues in TMNT Magazine (Panini) #12. “Own Worst Enemy” is an intuitive script that makes parallels between some obvious character traits, but it’s also a bit cliché and you can predict the story beats as you read along. Leo and Raph’s feuding is mirrored by the rivalry between Dogpound and Fishface, a quality that’s been seen in the cartoon since the characters were first introduced as Bradford and Xever. Like I said, it’s a bit obvious but only in so much as you can’t believe the cartoon hasn’t already done this plot. It seems so… what’s the word? “Obvious”? Man, I’ve been saying that a lot. It works, though. While the lesson about cooperation might be a little trite, with the villains comically blundering in order to show the protagonists what they might end up like if they don’t get it together, it works with everyone’s established characterization. And most of these stories have morality tales attached to them, anyway. It’s a kid’s magazine, after all. The only part of the story that lost me was when Leo and Raph trick Dogpound and Fishface into fighting, and with relative ease, I might add. All it takes is two sentences and the bad guys suddenly plummet below even the meager intellects we expect from them in a laborious attempt to resolve the story as quickly as possible. On the bright side, I think this is the first appearance of the Shredder in Panini’s TMNT book, albeit as an ominous shadow. I wouldn’t call “Own Worst Enemy” a bad story. The art from Bob Molesworth is good stuff, like all the art he’s provided for the magazine so far. And even if they are portrayed as being dumber than usual, it’s always a pleasure to see Dogpound and Fishface instead of the Kraang. The story is just a bit played out and you’ll recognize most of the tropes. Can't wait for a trade which collects these stories.